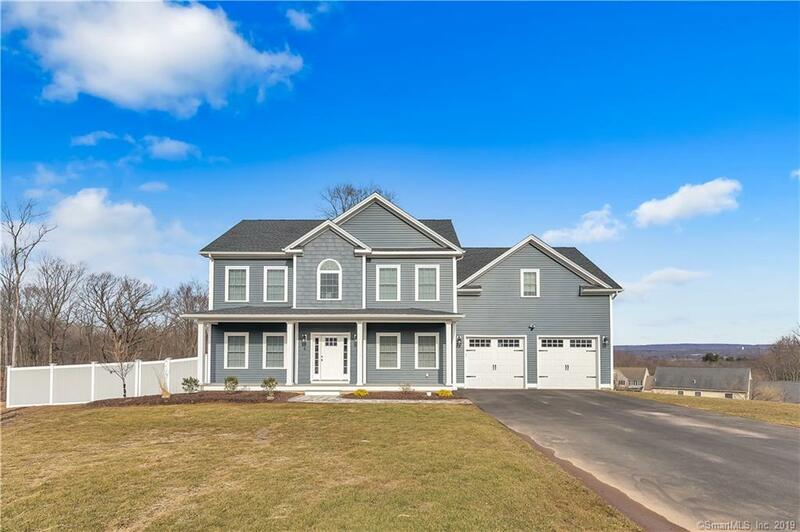 Stunning new construction colonial boasts expansive upgradesâ¦With an open floor plan, chef style gourmet kitchen, this center hall colonial caters to a comfortable and exceptional lifestyle. This is a wonderful custom home that was built for entertaining and filled with outstanding outdoor amenities including a fully fenced in yard, patio with firepit, 12x21 trex deck and a full covered front porch with columns. There is plenty of space among approximately 2,500 square feet, 4 bedrooms and 2.1 baths. Beautiful inlaid wide hardwood floors span throughout the open floor plan and the bright and airy interior. The main level features an inviting living room with gas fireplace with hearth, open to the dining room with double tre ceilings, central hallway with archway, and a magnificent gourmet kitchen featuring a huge center island with gas cooktop and ceiling hood, quartz counters, stainless steel appliances, under cabinet lighting, farm sink, and handsome new cabinets accented with moldings tied into the trim. On the upper level is separate laundry room and four bedrooms including an expansive, 500 sq ft master bedroom suite with his and hers walk in closets and master bathroom with slider barn door. The finely appointed master bath offers an indulgent escape leaving nothing to be desired highlighted by a pampering walk-in shower with rain head, niche, and bench, double vanities, frameless mirrored lighting, and more., Located on a quiet cul-da-sac road and spacious corner lot set on the west side of town, close to schools, highways and shopping! Low taxes, and best of all, Wallingford Electric which is the lowest cost provider in the state. New owners will enjoy the comfort and convenience of a new mechanicals, City water, city sewer, and fully fenced in yard. Located on a quiet cul-da-sac road & spacious lot set on the west side of town, close to schools, highways & shopping! Low taxes, & best of all, Wallingford Electric which is the lowest cost provider in the state.